This fast and flavorful dish is a simple recipe, quick and easy-to-make and so tasty! I got this capsicum rice recipe from one of our pot-luck party friends and I tweaked the recipe a bit to add more spice and crunch to it. Fresh crunchy capsicums, masala flavor and crunchy peanuts jazz up the taste of the rice dish and make this recipe a real winner! This rice dish is made by combining cooked rice in a roasted spice blend of cinnamon,red chillis,black gram,cumin,roasted peanuts and coriander seeds in ghee, infused with seasoning of mustard seeds, aromatic curry leaves and capsicums and garnished with roasted peanuts. The crunchy peanuts both in the spice blend and as a garnish lend the rice its unmistakable flavor. 1 Heat ghee in a cooking vessel on medium heat and add cumin seeds and black gram and fry till the cumin splutters and the dal turns light brown. Add the coriander seeds, cinnamon stick, curry leaves and dry red chillis and fry further for another minute till the rawness disappears and the flavors come out. Finally add the roasted peanuts and combine with the other spices for a few seconds and turn off heat. Once cool, grind to a make a fine powder. 2 In the same vessel, add oil/ghee and once its hot, add mustard seeds and let them splutter. Add the curry leaves and let the flavor of the curry leaves come out and the leaves turn crisp. 3 Add the sliced capsicums and fry them for approx 3 minutes. Donâ€™t over cook them, let the capsicums retain their crunchy texture. Add salt to taste and combine well. 4 Reduce heat and add the cooked rice and combine with the spice mixture. 5 Add the grated coconut,roasted peanuts and ground masala powder and combine with the rice till its well mixed. 6 Serve hot with any gravy curry of your choice or with just pickle, yogurt and appadam. Makes a complete meal ! This rice can be prepared using other vegetables like carrots, potatoes, gherkins, egg plants, bitter gourd etc. A lovely healthy rice dish, deliciously different, that goes with just about anything, or nothing at all! The peanuts really brings out the flavor, so don’t skip this step. Capsicum rice, never tried it before. Looks divine!! Great presentation! This is one of my favorite recipes…Until a couple of yrs back, Capsicum was in the list of veggies I disliked…but after getting to the US..I dint have much scope to fuss cos they are so few in variety 🙁 . My room mate makes this rice and also stuffed capsicum masala with nearly the same spice powder. And like u have stressed.. the roasted peanuts add a lot of flavor to the dish. Delicious recipe. Good one ! I will make capsicum curry with rice,Sailu. Instead of uraddal i add sengapappu and green chillies.Really it tastes good.Ya, I do add peanuts in almost all rice dishes.I love the flavor when it mixes with rice.I like bellpepper especially for its taste after cooking.Mom used to stuff and do atleast 14 (is neccessary,right) for curry lunch and dinner.But for 2 people I just simply make it as a curry /hot rice or mixed rice. Your photos looks really nice. I am missing spoon in your photos ,Sailu. Vineela, I also prepare capsicum curry (different variations) that go with with white rice and rotis. That dish looks delicious. Will have to try it. BTW, I love the way your comment preview works. It is really cool :). Looks beautiful and delicious Sailu. I hope the recipe will be good for other peppers(red, yellow etc.) as well. Wow Sailu I lov capsicum flavored rice.Urs looks very spicalicious..will definitely try soon!!!!!!!! I tried ur mamidikaya-kobbari pachadi.. It was excellent. Actually I wanted to make mango rice..and got all the ingredients ready ..but the mangoes were not very firm ..so I made pachadi…and chaaaala bagundindi. 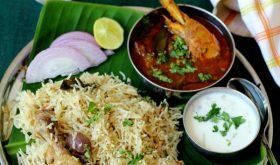 what lovely looking rice sailu…. This sounds oh so good! I like capsicum rice very much. Your version looks great!!!!!! Mee capsicum rice channa bhagundi never tried it have to give a try, Mee snaps chuste system lo nunchi spoon to teesukune software edana unte bhagundu anipinchindi. Rice looks very yummy ..will try it definitely !! Your new website is very nice! Good work! I love that not only does this look and sound delcious. It’s healthy, too! Thanks for the recipe! Yummy sailu! I am definitely going to make it. Photos are cool! 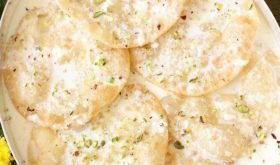 chala bavundi recipe and snaps. Your photos are very impressive, well done. Thank you for the recipe, never tasted it before, will try this out. Capsicum Masala Rice is Yummy… Followed the Recipe just like you mentioned in your blog and exactly all the ingredients….WOW final Look and Taste…Really Really GOOD…. I am glad you enjoyed the rice dish,Kay. Thanks for dropping by, Tipirneni and your kind words on my blog. I tried Capsicum rice today .. it came out very well, Thanks for the wonderful dish.Presentation is awesome. and your method of explaining the procedure is very good. Ur capsicum rice dish really has got awsome taste. i tried it 2day!! cdnt wait to thank you….so thanking u immediately b4 i serve it to my family. b4 i used to get bored with capsicum dish which i used to make…. this is really different…. can u plz post many dishes on capsicum plz….. capsicum seems to be a typical vegetable which wd taste better when cooked in proper way and shd be accompanied by good spices….so can u plz share more capscicum curries….. plzzz!!!.. Your most welcome, Sushma..:) I am so glad you enjoyed capsicum rice. I will try to share more recipes using capsicum in the near future. A very through explanation with great photos and nice recipes. I must commend you on the work. Very Nice!! Thanks for dropping by and your kind words, Mrinal. Am glad you liked the taste, Nithya.. Tried this recipe today & it tasted awesome. I’m not a great cook but manages to prepare daily bread for me & my husband. Looks like I am going to fall in love with my kitchen…trying your recipes..:-) Thank you so much..
Hi Sailu, We tried the Capsicum rice today and the outcome was excellent. So much flavor and really very tasty. Peanuts are definitely an important ingredient in this dish. Thank you for sharing the recipe. I tried this recipe today, and it was absolutely fabulous. I added a splash of lemon juice at the very end to brighten the flavours. I had one small problem, though. When grinding all the spices and peanuts for the dry masala powder (in my coffee grinder) it turned into more of a paste than a dry powder, due to the fat content of the peanuts, I think. Should I just powder the peanuts separately? This did not affect the taste at all, only the masala tended to lump up and it was a bit difficult to distribute it evenly because of that. This is very minor, though, because the taste and appearance were simply sensational. Thank you so much for being so generous and sharing such a lot with us. I really enjoy browsing through your site, and have marked out many, many recipes that I want to try out. I am so happy to hear you enjoyed the capsicum masala rice. The spices and peanuts must be totally cool before grinding and like you said, you could pwd the peanuts seperately and then combine with the spice pwd. Hope you enjoy the other recipes you have bookmarked to be tried. Hi Sailu, thanks for the suggestion. I was going to make this tongiht, but have no peanuts or black gram. Could you suggest any substitutes, or should I better wait until I get the right ingredients? I was going to substitute peanuts with cashews, but I’m not sure about black gram. What do you think? Thanks! I suggest you wait till you find the right ingredients. Peanuts are a must and there is no substitute for that. Well, you could substitute bengal gram for black gram in case you don’t find black gram. Thanks for a speedy reply! I will probably wait until I get some peanuts. thaks for sharing recipe. I have a small doubt. You said 3 cups of cooked rice. That means 3 cups raw rice i need to cook or cooked rice is 3 cups. Can u please clarify my doubt? So that i can prepare this recipe as soon as possible. Thank u very much. Its 3 cups of cooked rice, Sridevi. You can adjust the rice according to the masala, by checking the flavor. 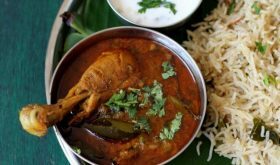 Hi Sailu….Really a wonderful recipe……..choostuntene notiloki neellu vastunnayi. Mee site chala bagundi..nene chala recipies nerchukunnanu. Simply superb. Excellent recipe, it sure is a keeper. 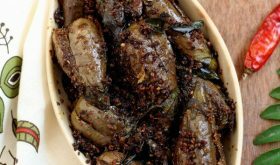 I tried this recipe and have recieved so much praises from my Mother in law and father in law…Even my husband liked it very much…i even tried substituting Brinjal instead of capsicum and it was also really good. Need an small favor Sailu….My Husband wanted me to make Cucumber rice…he has tried this somewhere in Visaka….wanted to know how can i do it? Thanks for informing me, Dev. I made this dish yesterday night and it turned out great.Even i had 2 capsicums screaming for attention as in ur case.Usually i would have made some sort of curry with those but this is a very different recipe though. Nenu kooda Vizag nunche.. Akkade perigaanu. I love your website & visit it every day and feel that I am visiting a close relative in Vizag. Love all your pages. I tried this rice on a friday evening & it was done in a snap & tasted awesome. We were tired & this made our day. I tried it with cooked semiya another day, served it with coconut chutney to guests. Love your pictures. You are inspiring lakhs of people. Keep going. Hat’s off to you. I haver tried this recipe atleast 10 times so far. Its a big hit in my family and I also shared this website with some of my friends. They liked this dish very much too. Thanks a lot for posting this. It tastes yummy… simply loved it and its so easy to make! Sailu, we loved your recipe for capsicum rice! The masala u have made up was amazingly aromatic n extremely tasty! Tks so much! I tried this recipe on New Years, big hit with my family & friends. Thank you for sharing. You can see the picture in my blog. Tried it this morning, turned out awesome! Thanks fr the recipe. I tried this recipe and came out really good.Thanks for the nice recipe. Tried it, loved it and blogged it 🙂 Thank you so much for sharing this delicious recipe. Hi sailu, you are giving nice recipes. Is it possible to buy book regarding the recipe’s on the net. Pls reply for the same. Sailu your recipe Capsicum masala rice is excellent. i tried it in my home. Its delicious. My children loved it very much. looking forward for more delicious recipes. I never tried it before. It’s tastes really good. I tried it. it comes well and very taste adn useful for my office lunch box. Keep blog other lunch box recipe, which is useful for working people. I love cooking and daily preparing my lunch box. I had some Red Capsicum sitting in my refrigerator waiting to be used up. I made your Capsicum rice with those, and here is to you – another person complimenting! A very comforting dish Sailu. The red bell peppers might be a bit tart for this rice, and personally I’d favor the green capsicum! 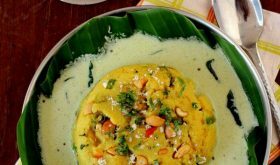 I have tried this recipe of urs and it has come out really well. So simple and yet so bloody tasty…. I’m yet to be disappointed by one of your recipes. Good job! Hi sailu your recipe for capsicum rice is just excellent. I tried it and loved it.My new fav dish!! Your recipe has been copied on edivyaraj blog spot. Com. Hi, it’s fine if I make steam rice after I mix all ingredients?